I first reviewed Comics Head in 2013. It’s a website and also an app our children can create a comic with. When I learnt that the latest update to the Comics Head app for iPad, version 3, had major new features, I decided to investigate. - Export comics as pdf or image files! - Transport your comics to Google drive as an Image, an Editable Comic, PDF and a Video. - Upload your comic as video on YouTube! - New updates are always around the corner with new art assets!! - An option where you can sort out your pages! - Inscribe your voice into your story with our Audio speech bubbles!! You can also edit and import audio with this feature! - Add your own touch by painting your own images! - Use the Preview mode to check out your masterpiece before you publish it! I LOVE to find ways for kids to tell stories. While some kids prefer to make comics with pencil and paper, lots aren’t confident with their drawing skills. This is where Comics Head overflows with abundance. There are just so many art assets and templates to choose from. AND they’ve added the option for users to draw their own images. I loved the audio feature and the option of uploading to You Tube too. The app has really become very full-featured. When I took the latest version of the app for a test drive, I kept bumping into features I could see would be valuable in an educational context. For example: there are templates available that kids could use as writing prompts. 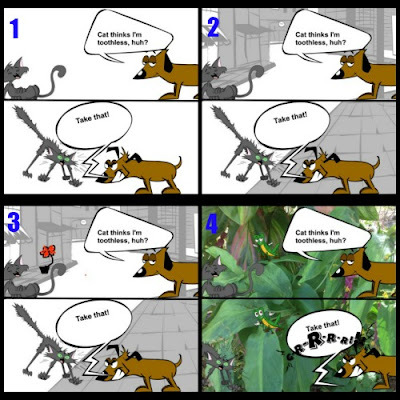 All I had to do in image 1 was to choose a template with two panels of a cat and a dog, and figure out some dialogue that would suit. For some students, this kind of scaffolding is a must. As they gain in confidence, they could continue the cat and dog narrative, either with the same panel, different additional panels, or in writing. The great thing is that the deadly numbing effect of “I must write something but what?” has disappeared without them realising it. In image 2, I chose a background for my cat and dog characters. Simple, easy and able to be saved and shared. In image 3, I decided to try the paint feature and “drew” a flower in a pot as an added prop. In image 4, I took the iPad camera outside and grabbed an image from my garden as a new background. Then I edited again and added a speech effect and another character. The editing process is beautifully simple - elements can be resized and positioned easily and quickly. I also tested the audio and video functions. They both worked smoothly. I started with a blank template this time, chose a background of the Sydney Opera House from Themes, used Effects to make it half-tone, and added a chook and an emu celebrating Australia: Story Country. I recorded my own voice with a few words, then transformed the whole to video. I had to sign in with my Google details, then uploaded the very short video below in a matter of seconds. I grabbed the embed code so I could share it here. Being able to take photos from within the app is a boon for kids who naturally want to include life around them in their stories. Imagine being on a school excursion and able to take pics then use characters and dialogue from within the app to record important aspects! Or at home being easily able to snap arranged figurines or LEGO within the app, then adding dialogue and building scenes. You can also access earlier photos from the camera roll when making a comic, or use cartoon style art work provided by the app. Creative storytelling heaven! Do I sound enthusiastic? I am! Okay, yes, there’s one thing - I would love the developers to add more Australian birds and animals. Maybe that will come in the next version… Meanwhile, keep Comics Head in mind if you want a fun app that has excellent navigation and sharing features, and encourages students to create. For kids who are not keen on expressing themselves in writing, creating a comic with an app like Comics Head helps make writing less of a daunting task. Carefully considered short, pithy sentences combined with images are a wonderful way to communicate with an audience. 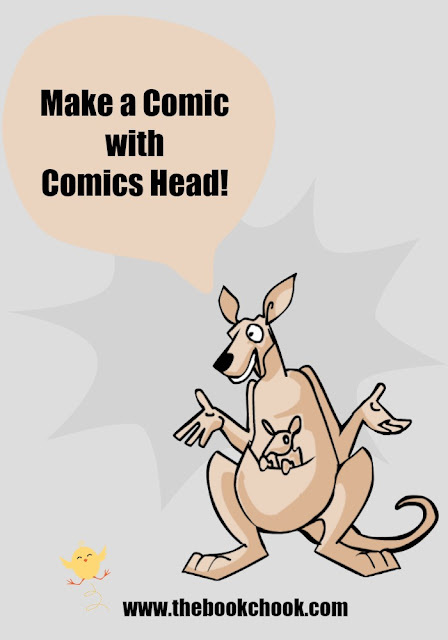 With Children’s Book Week fast approaching in Australia, Comics Head would make a very cool way for children to tell all sorts of stories. At $Au7.99 ($US4.99) it’s not cheap, but I honestly think it’s worth the money for such a versatile and full-featured app. Don’t take my word for it - try the Lite version for free!